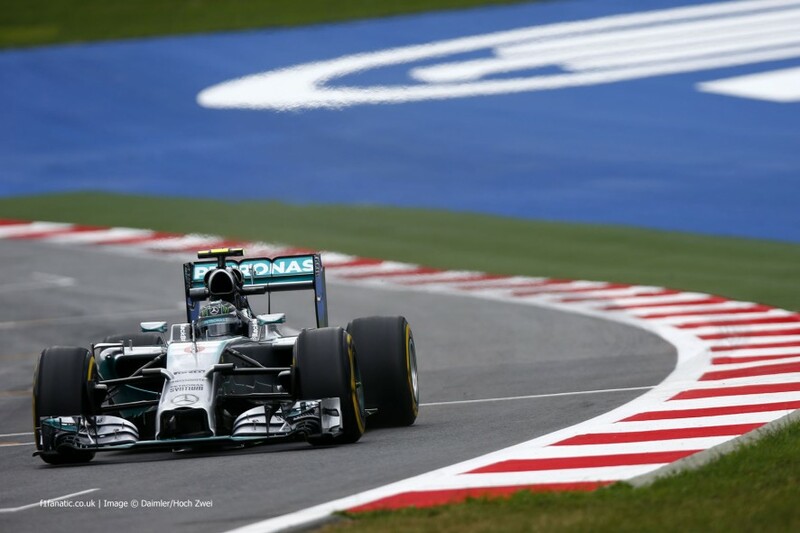 Formula One: Mercedes pair top Austrian practice! 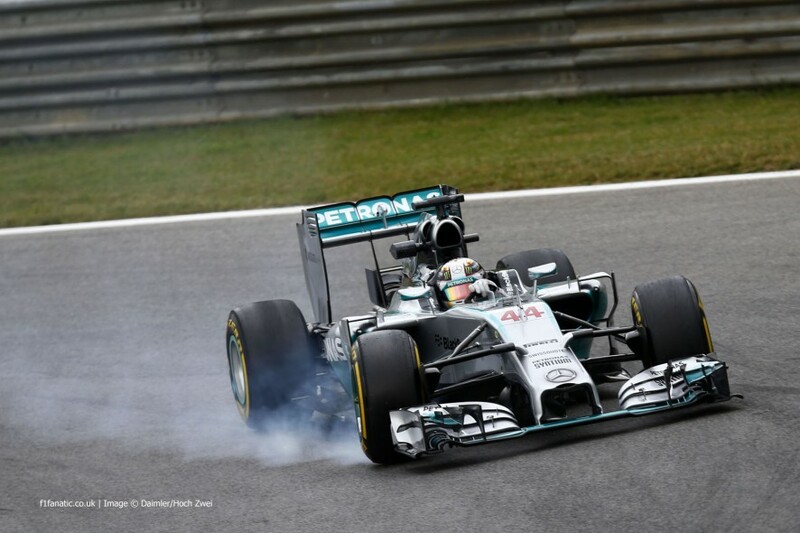 Home » Formula One: Mercedes pair top Austrian practice! Formula One returned to Austria for the first time in 11 years today as practice got under-way for this weekend’s Grand Prix at the Red Bull Ring. Formerly known as the A1-Ring, the last race was won by Michael Schumacher for Ferrari, with the demolition of the pit buildings and grandstands in 2004 rendering the circuit unusable until a €70m reconstruction by Red Bull. After Daniel Ricciardo’s maiden F1 win 2 weeks ago in the Canadian Grand Prix, Red Bull may have been hoping that their team could win at their track, but early indicators suggest that it’s Mercedes race to lose; although that is what the German team managed to accomplish in Canada. The reliability problems suffered in Montreal seemed to slightly resurface for Nico Rosberg in practice 1, with his WO5 silver arrow slowing early on. Team-mate Hamilton had to avoid him, with Nico heading back for a short stay in the new pit buildings. The early problems, coupled with some new FIA skid blocks to produce sparks and some apparent excitement, didn’t hamper him, with Nico managed to end the session with the fastest time. One tenth down was team-mate Lewis Hamilton, who ran more laps than Nico but was unable to best him. Ferrari’s Fernando Alonso was 3rd fastest, with team-mate Kimi Raikkonen further down in 11th; also testing the new skid blocks. Ferrari’s former driver Massa was 4th despite having ventured into a gravel trap; a problem hardly seen at any other circuit due to the rise of tarmac run-off. Jenson Button was 5th fastest for McLaren, ahead of the two Force India’s of Sergio Perez and Nico Hulkenburg; the pair both hoping for a good qualifying for their quick cars. Valtteri Bottas was 8th ahead of Kevin Magnussen and Jean-Eric Vergne; who was once again the fastest Renault-powered car for Toro Rosso. Neither Red Bull featured in the top 10, with Daniel Ricciardo 13th and Sebastian Vettel 15th after a massive spin at the final corner. Marcus Ericsson and Adrian Sutil befell technical issues and were both in the final 3 positions. Mercedes were once again on top in the second practice session, but the positions were reversed between the two drivers. Lewis Hamilton took the fastest time of the session, with Rosberg having to make several attempts to get within 3 tenths of him. Fernando Alonso remained in 3rd for Ferrari, with the two Williams cars of Valtteri Bottas and Felipe Massa were just a few thousandths of a second behind. The two Red Bulls improved after their dismal first practice, with Vettel 6th and Ricciardo 8th. Jenson Button separated the pair in 7th. Kevin Magnussen and Jean-Eric Vergne maintained their positions from the first session in 9th and 10th. Kimi Raikkonen was once again just outside the top 10 in 11th place, with Kvyat in 12th, Perez in 13th and Gutierrez in 14th. Pastor Maldonado was 15th ahead of Sutil and Hulkenburg, whose Force India looking a lot slower than it was in FP1. Max Chilton was 17th and was a few thousandths ahead of Romain Grosjean’s Lotus and fellow Marussia driver Jules Bianchi. The two Caterham’s completed the time-sheets.